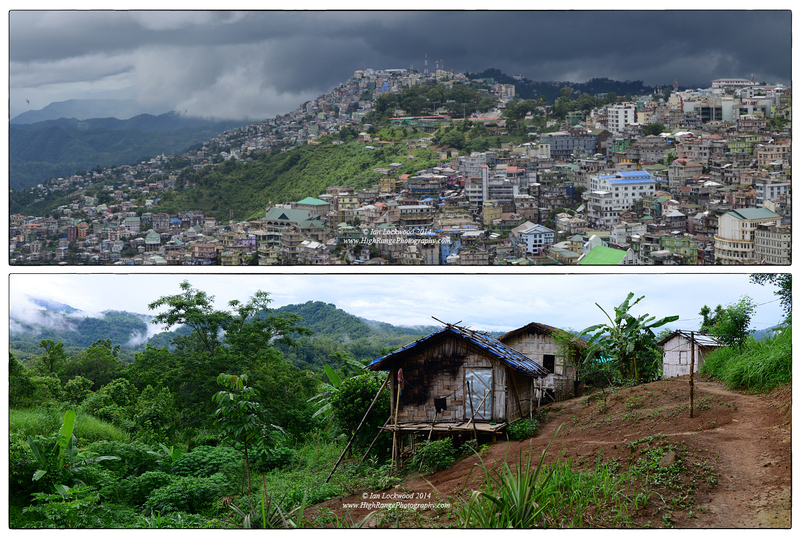 Contrasting views of settlements in Mizoram. Monsoon clouds prepare to deliver a shower to Aizawl in the above image. The city is composed of densely packed multi-storied concrete buildings. Below a traditional rural dwelling made of bamboo and mostly natural materials in Sairang. The North Eastern states of India are blessed with high levels of biodiversity, a fact linked to their geography and historical position as a crossroads of evolutionary activity. They sit on a tectonic fault line between the Indian and Asian plates and enjoy a tropical-temperate climate nourished by the monsoon. The proximity of the eastern Himalaya plays a key role and there are a variety of biomes within the area created by the variation in relief and climate. The seven states of the North East (Assam, Arunachal Pradesh, Nagaland, Manipur, Mizoram, Tripura and Meghalaya) have a biogeography influenced by South East Asia, the Himalayan landscapes and to a lesser extent the main India plate. There are two recognized “biodiversity hotspots” that NE India is a part of-the Eastern Himalaya and Indo-Burma biodiversity hotspots. Human population density is relatively low compared to India’s other hotpot, the Western Ghats. However pressure from hunting and trapping, as well as industrial mining, dam-building and plantation agriculture is significant. On a recent visit with my wife’s extended family Mizoram I came across some encouraging signs of changing attitudes towards wildlife. The small state of Mizoram is geographically isolated, being wedged between Bangladesh’s Chittagong Hill Tracts and Burma’s Chin hills. To the north it is connected to India via Assam, Tripura and Manipur. 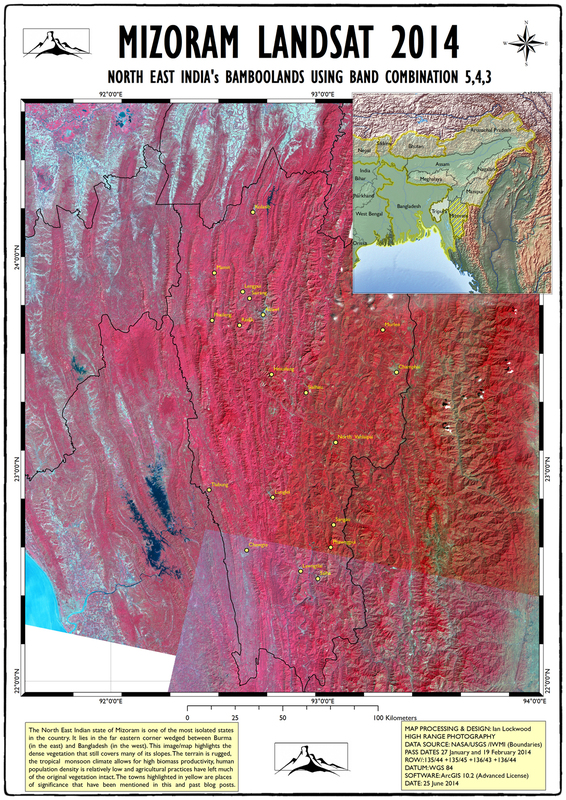 Mizoram is composed of a series of rugged ridges running north to south (see the Landsat map below to see these clear patterns). The origins of these mountain ranges (Lushai and Chin Hills) are closely tied to the collision of the Indian and Asian plates 60-65 million years BP. When driving in and around Aizawl the capital, one is reminded of this drama. Layers of alluvial sediments that were thrust up during the collision are clearly visible on road cuts and at construction sites. I had an opportunity to discuss these fascinating origins on a drive around Aizawl with Raina’s nephew Dawng Tea who is a well-geologist working with IOC. They are prospecting for natural gas south of Aizawl and he has had an opportunity to see and study much of Mizoram’s geology. Mizos have traditionally had a very close relationship with their physical environment and it was not so long ago that all aspects of their lives were closely governed by the rhythms of nature, seasonal cycles of rain and shifting agriculture (jhuum). Hunting was an important activity, both as a practical source of protein as well as an important rite of passage for men. In my family my bother in laws, uncles and cousins of my generation had a strong relationship with the outdoors through hunting. On my past visits we never went on an outing without several different rifles and shotguns in the vehicle. But these habits are changing and it could not come sooner given the generally alarming state of wildlife populations in the state. 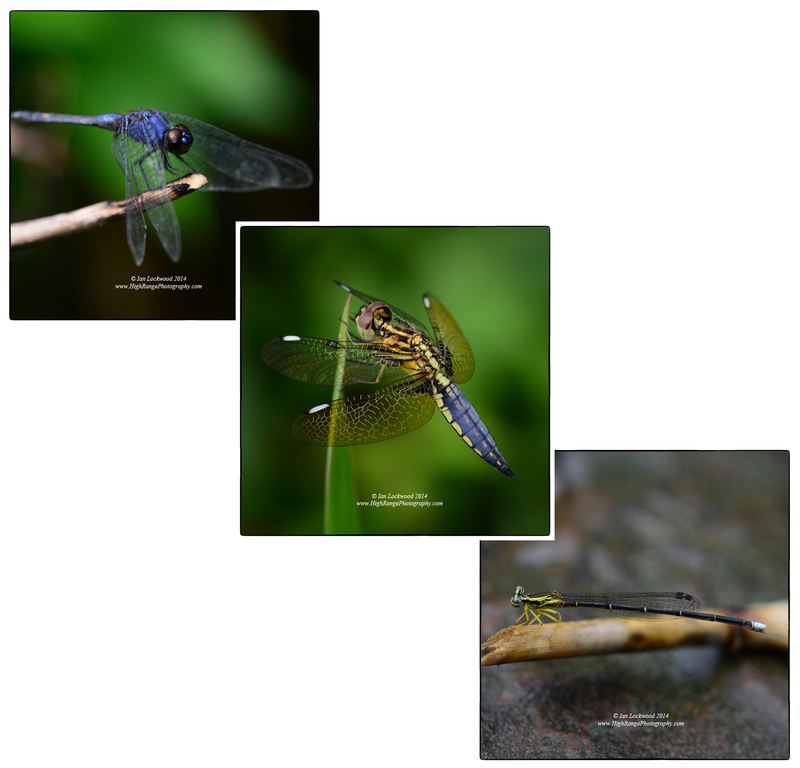 Something different is happening and it is thanks to digital photography and a growing awareness about the fragile sate of Mizoram’s wildlife. On our visit during the monsoon of 2014 I noted that the guns are rusting in a corner and now my same brother-in-law is nuts over wildlife photography! Odonata at Sairang just north-west of Aizawl. Spot-tailed Pit Viper (Trimeresurus erythrurus) at Mizoram University’s Department of Zoology and in Durtlang (right). Unidentified subspecies of the White Lipped Pit Viper (Trimeresurus albolabris) at Mizoram University’s Department of Zoology. Note the red eye which is unique and different from the normal specimens. H.T. Lalremsanga and his colleagues are in the process of describing this as a new sub-species or species. 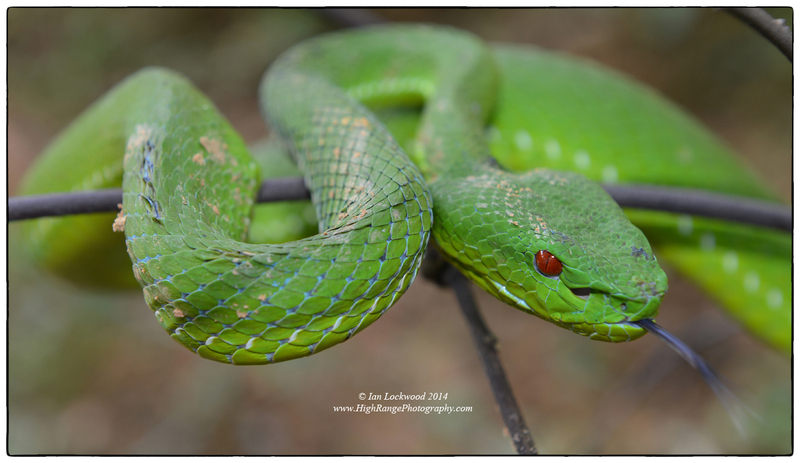 Portrait of an unidentified subspecies of the White Lipped Pit Viper (Trimeresurus albolabris) at Mizoram University’s Department of Zoology. There are several Mizo wildlife site on social-media that have become a forum for what is being seen. Some of what people share on their Facebook pages include sad scenes of road kill or hunting trophies, but increasingly there is a cry from members of the group to protect the rich biodiversity of the state. Mizo Nature Watch looks at all aspects of ecology in the state (plants, animals, landscapes etc.). Zoram Rul Chanchin focuses on herpetological diversity and is moderated by H.T. Lalremsanga of Mizoram University’s Department of Zoology. I was able to spend time at their temporary office and meet other members of the group who are connected with the university. They are doing pioneering work on documenting the fauna of the state, while working to educate communities about protecting what they have. The campus has become a model mini-protected area. It was once heavily jhuumed and is now seeing a return of plants, insects, birds, snakes animals and other creatures that are difficult to see alive anywhere else. 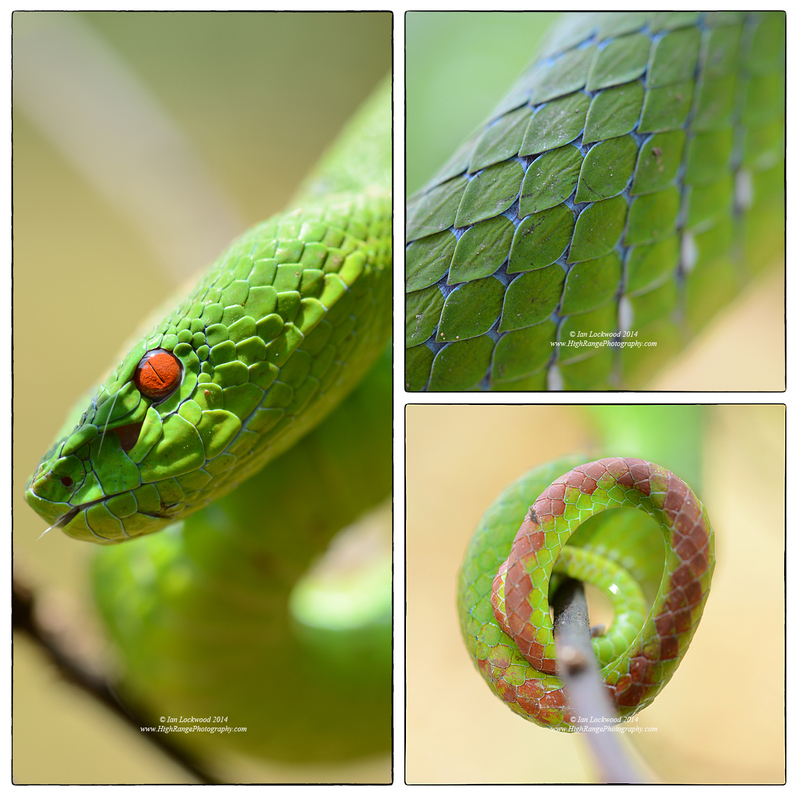 During my stay I was able to interact with RCa and Isaac and the exquisite pit vipers that they had rescued (see photos above that are courtesy of the Department). Aside from academic institutions, a numbers of individuals have taken up wildlife documentation and rescue as a hobby in Aizawl. These experiences and discoveries are shared with friends and the wider world via Facebook and other social networking sites. Digital cameras, be they cell phone cameras or DSLR are the tools of the trade to record and share discoveries. Knowing Mizo is helpful and I have only been able to make sense of the discussions thanks to my wife Raina. One evening this last June, my brother-in-law Kuka took me out to meet some of these wildlife enthusiasts near to Durtlang, which lies above the main city on a high ridge. Kuka was once a die-hard hunter but has become completely enamored with his camera and is now producing superb images of birds that he has encountered. Kuka has seen his share of snakes but this night was to be his first time getting up close through his lens. In a modest house we met three young, enthusiastic wildlifers. They had a few snakes (all rare, with relatively restricted ranges), which had been rescued from nearby houses and were about to be released. Perhaps more interestingly, they took us for a night walk on the road leading out of town. It had rained earlier but now the stars were out and a cool wind blew over the ridge. Within the first 30 minutes our friends were able to show us three different gecko species, one of which is a bent gecko that may be new to science! This was one of my last nights in Aizawl and I left feeling both hopeful and excited about the future of wildlife in the state. 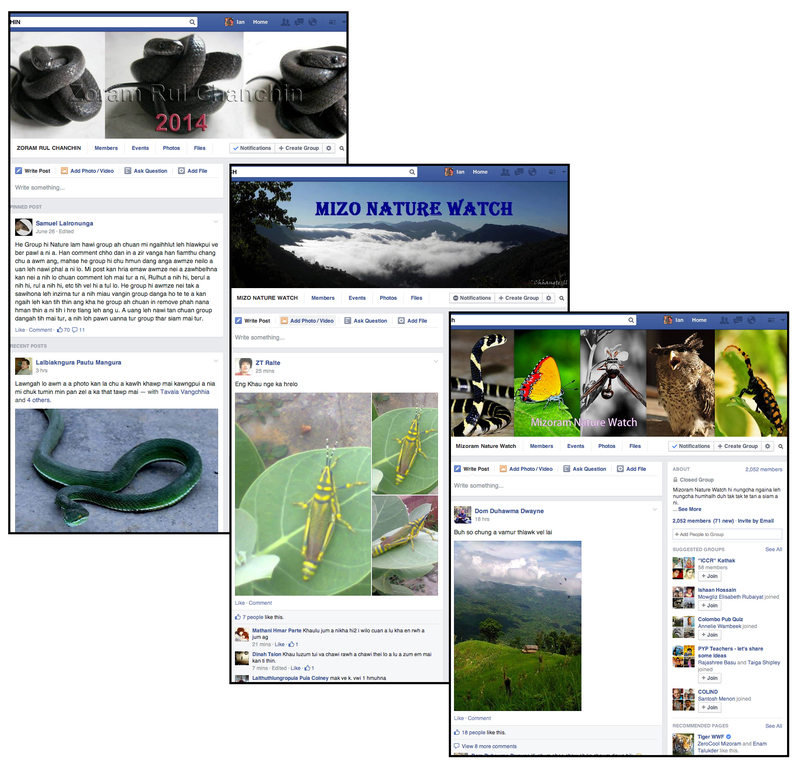 Collage of selected Mizo snake and wildlife social media pages. Unidentified Bent-Toe Gecko (Cyrtodactylus sp. 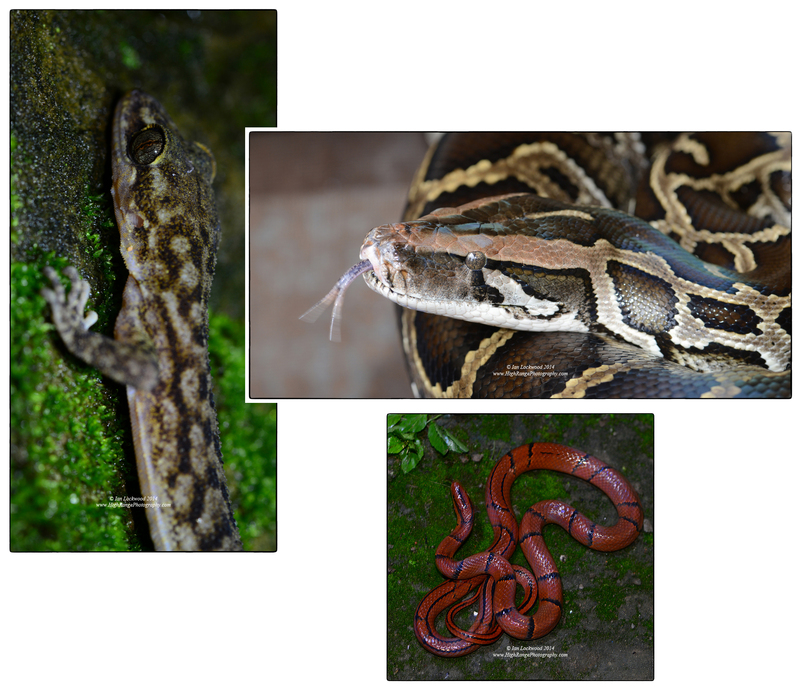 ), Burmese python (Python molurus bivittatus) and Banded Trinket Snake (Oreocryptophis porphraceus) at various locations in and around Aizawl. Landsat view of Mizoram (click on image for A1 100 DPI image). I worked on this over the rainy days that we spent in Aizawl. Ahmeed, Firoz, Abhijit Das and Shushil Kr. Datta. Reptiles & Amphibians of the North East: A Photographic Guide. Guwahati: Aaranyak, 2009. Print. Ved, Nimesh. Blog. (a great site for documentattion of his important work to promote wildlife and conservation education in the remote corners of Mizoram). Whitaker Romulus & Captain, Ashok. 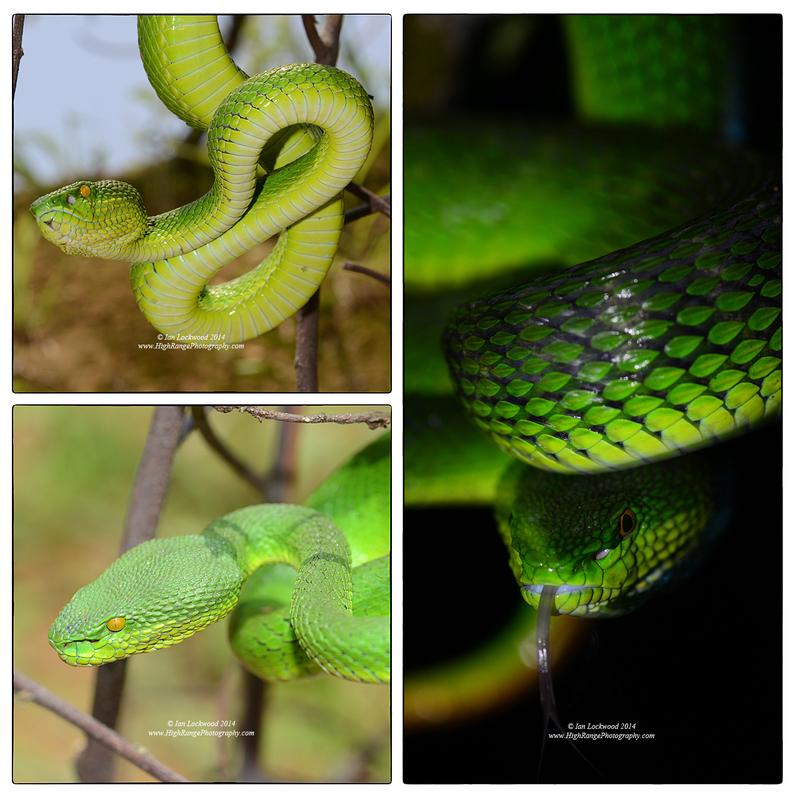 Snakes of India: The Field Guide. Draco Books, Print. 2004.